Ok, people...some of you are on break already, some of you even get done by this next week, but for me...I have to teach until December 22nd. STEM after school classes for the second quarter start up this week which leaves me two weeks before a break. I have been getting a lot of great questions from educators about finding time for science and STEM in their classrooms which to me can go hand in hand with language arts. However, in our district our language arts curriculum is set in stone, so then what do you do? Finding time to tie in a picture book along with a science concept...followed up with a STEM connection is the way to go! 1. Start with a concept you need to cover is science...let's just say water. I have to teach this in 3rd grade. 3. Now for an anchor chart...How do we use water? How do we hurt water? How do we protect water? 4. From taking a dropper with one blue drop of food coloring dropping it in a glass of water, you can add more water and dilute it, but that blue is still there. 5. A writing lesson can come of it such as a public service announcement for kids to help kids make good choices about protecting water, you can do a letter to congress, or even a poem. 6. How do you add STEM? We give 20 minutes to create a pipeline that goes from Canada (one side of the table) to Gulf of Mexico (the other side of the table) that is made out of cups, different types of tape or putty, and straws. They are the oil companies and I am the American People. They need to make sure there are no spills so that the water is protected. 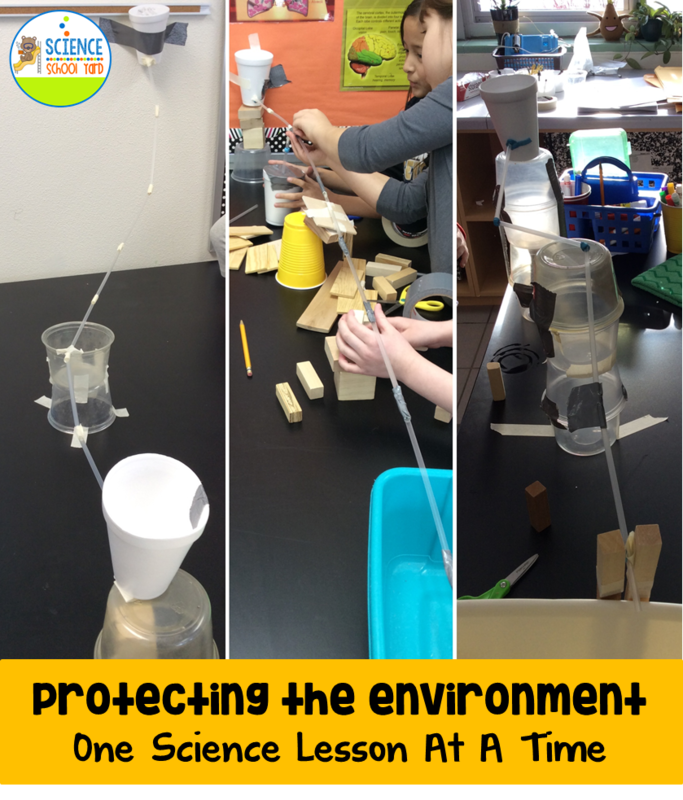 STEM Challenge: Can you create a safe pipeline from one side of the table to the other to show the importance of protecting our freshwater from oil spills? Objective: Learn about the distribution of water on Earth and the importance of keeping fresh water clean. I give each group time to draw and design a leak proof pipeline picture. They need to discuss how important it is to be very careful and accurate in their cutting and connecting the pipeline. I ask them where do they think leaks will occur and how can they make sure it is sealed properly. I give them time to create. Most groups have leaks. We share, clean up, reflect and then talk about how important it is that we look at all points of view when determining if it is worth creating something that could have a negative or positive impact economically. Now, if this is too controversial, I also do an oil spill in a bucket. I have rocks as land, plastic animals are real animals, and sticks and paper leaves that are placed in the rocks as trees. You can also use just three paper bowls with water and a spoon full of oil. 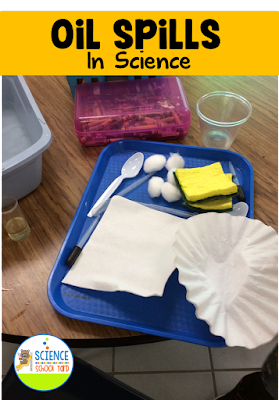 You can have a demonstration or in groups where they get three different ways to separate out the oil from the water: skimming: by using a spoon they can try to skim the oil off the top...collecting and measuring how much they were able to skim off the top. Next, you can test absorption: give them cotton balls and have them absorb the oil off the top, squeezing it out to measure this method, and then finally dispersal. Use Dawn dish washing soap to disperse and then collect the oil to measure. What they will see is that none of these ways are 100% accurate. What could be invented that might be better at skimming, absorbing, or dispersing so it is a better solution to an oil spill? I have included a the lesson plan and record sheet for you and your learners HERE! Looking for more STEM water activities? This pack is where it is at! From Hurricanes to shoreline protection that focuses on erosion...these are the extra resources I use during my FOSS Water Unit! If you are a primary teacher, I have another great way to integrate something real fast through your rhyming lessons...grab Sheep In A Jeep by Nancy Shaw. Objective: How can you create a force that will push a Hot Wheel to a specific location? 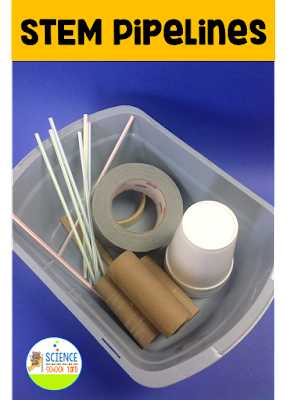 What a great way to teach rhyming words, but to also teach about force and motion in the process! 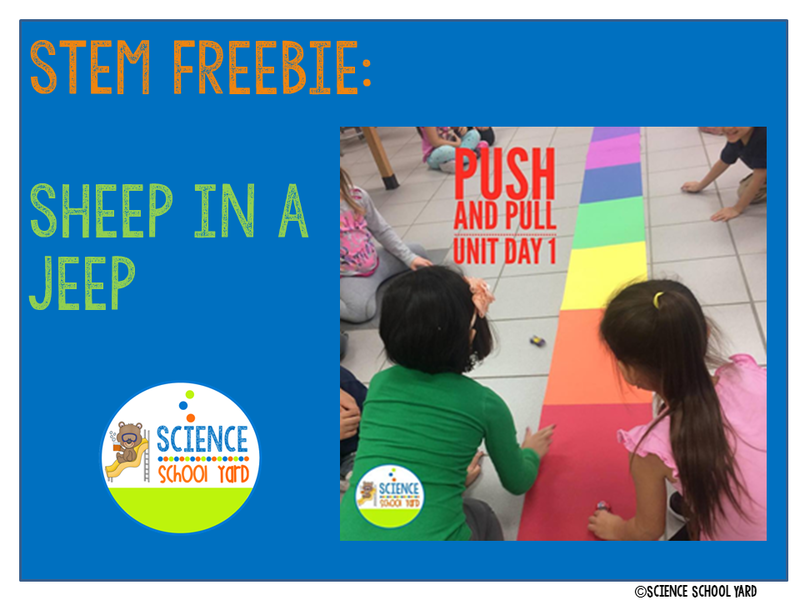 Grab some hot wheels, create a road out of the colors of the rainbow papers taped together, write the colors are note cards for the kids to pick from...then set up a race. Discuss giving a force to something...it means a push or pull. The harder you push the more force is acted on it. If I need to get my car to go to the orange on our road, I will push it soft, but if I need to push it to purple I will need to push it hard. What if I had a bigger car to push? I would have to push harder to get motion going because of the mass. We make this a bit of a challenge...who can closest to the color chosen! They love it! Grab the freebie. Want more? 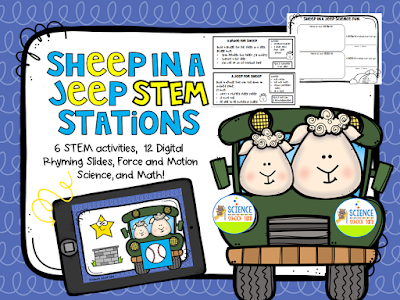 Grab the whole STEM pack here which includes more science activities, technology component with 12 rhyming slides with Sheep In A Jeep theme, 6 engineering lessons and two math activities along with record sheets and worksheets! Five more days...Thursday's forecast is for over 10 inches of snow and Friday is a bonus school wide movie half day and celebration the other half. I think I can...I think I can...enjoy the freebies and ideas! I love your letters and questions...it helps me know what you need!